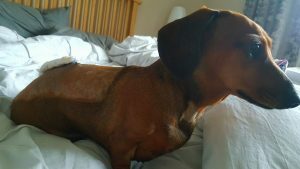 Is A Dachshund The Right Dog For Me? Help Santa Save a Sausage Dog!! Dawn Shaw-Moir – Roo – 5 Years old. 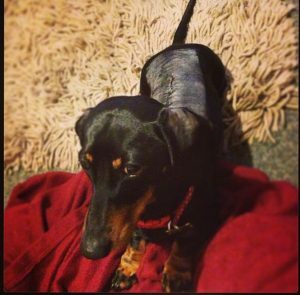 Please please please, be aware that it could be that as many as 1 in 4 dachshunds have an episode of IVDD some time in their lives. Intervertebral disc disease symptoms happen when the jelly like content of the disc between vertebra squeezes out and presses on nerves causing severe pain and damage. Early symptoms are easy to miss or mistake for something else and If action is not taken quickly the dog may be permanently paralysed. 4. If in doubt, insist on a referral to a practice who can MRI. This is the ONLY away to accurately diagnose the extent of the issue. An X-ray is NOT enough. 5. Many dogs can be treated ‘conservatively’ with extended crate rest for up to 8 weeks, but the longer it is left or the more severe the symptoms, the less chance of fill recovery. 6. If surgery is needed, it will cost upwards of £4-9000. Above all, if you have a Dachshund, take out insurance, or put money on one side. If you are saving up for a Dachshund then save up for insurance too. The risk is simply too high not to. More information here. Please particularly read the section on symptoms. We had three dachshunds of around 6 years old. The youngest and seemingly fittest of these, out of nowhere, burst a disc in his spine and was in immediate agony which swiftly transformed into paralysis and misery. The vet took x-rays and told us that the prognosis was grim -that there were at least 7 more areas of calcification which would probably rupture more discs. We sought a second opinion and I asked this second vet what she would do if this were her dog. She said ‘This was my dog. We had the same experience with ours. It wasn’t fair to keep her so we put her to sleep.’ She examined our boy, squeezing and pressing his paws to no reaction or response from him. We’d agreed earlier that if this were to happen we would let him go. I remember the suddenness. There was NO sign, NO warning. One day he was with us and the next he was gone. We always thought he’d be with us the longest. Look after them and cherish them while you can, because even if you do everything right for them, this happens. Our little girl is 12 weeks post surgery. 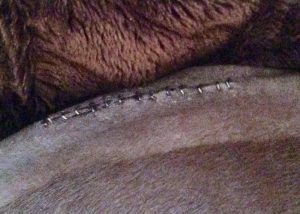 The disc went so quickly and at such speed we thought she would never walk again but with our wonderful vet support, surgery at the Willows, Solihull, physio, acupuncture, hydro treadmill and lots of commitment at home she is walking again, all be it in a wobbly fashion. We could never have given her this chance had we not had insurance. Her jumping days are over but she is getting her confidence and spirit back. We may never know exactly what happened to cause this, one day she seemed quiet and under the weather the next she couldn’t walk and was crying constantly. We are now transforming our house to make life better for her with rugs, stair gates, ramps etc. She has been an amazing patient, so tolerant and loving even when she must have been going through hell. They are stoic little characters and that is part of what makes them so loveable. I would never chose a different breed but I always advise prospective owners to do their homework first and make sure they could cope emotionally and financially if they had to go through what we are going through. My husband and I have been married 43 years and we have enjoyed having dachshunds as part of our family for the whole of that time. During that time some of our dogs e perienced a sudden onset of back pain resulting in not being able to walk. We would then do as many of your followers have done…..medication and extreme rest. All stairs out of bounds and no jumping on couches or chairs. However in retrospect it seems to me quite clear that in actual fact we dachshund lovers need to try and prevent the jumping before our “babies” start to have problems. I know they are little rascals and adept at getting their own way, but I think if I am fortunate enough to have another dachshund I will be a little stricter. This is by no means a criticism because I know how much we all love our dachshunds just my own personal thoughts of my own experience. We are all devastated when we lose one of these special little dogs. Since meeting my husband nearly 40 years ago there has always been several dachshunds in the family. We are currently on numbers 6, 7 & 8. Our first was a longhaired but all the others have been wirehaired. Of the 7 wirehaired two have had IVDD. Holly the first recovered to such an extent you would never have known unless you were really looking for it which was a slight weakness in the left hind. Unfortunately, she developed Lafora in later life (11) and had to be put to sleep. 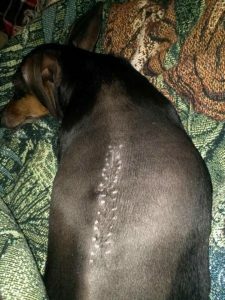 After Holly, although she recovered so well, we vowed we would never put another dachshund through the discomfort and pain that she went through. We spent hours with her on our laps doing physio, swam her once a week for two years to keep her back strong, and she was active running around six acres twice a day. 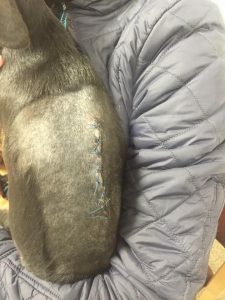 The spasms she experienced, probably in the beginning every six months, were awful until we found a McTimony vet who would check the alignment of her back and put her straight without force. I discovered rescue remedy and homeopathic remedies which dealt with both the pain and muscle spasms without the side effects, after my vet expressed concern about giving her long term painkillers which would shorten her life by damaging her kidneys. The McTimony treatment and the hydrotherpy were the main assistance in giving Holly a quality of life, but it took a couple of years, and extended her life by 7 years, which we are advised is unusual and normally 3-4 years is what is expected at most. 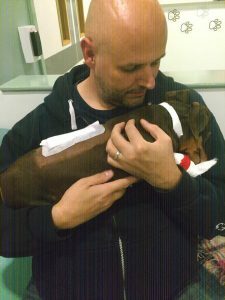 Our latest IVDD was earlier this year. Our dear little Jazz who became paralysed very quickly, and from being such an active little dog, who gave us no real warning of discomfort, to not being able to do anything herself. Although we had vowed never to put another dax through the op, our own vet was away on holiday, and the one we saw, referred us to a so called back specialist. We gave her the chance on his recommendationand let him operate but wish now we never had. Jaz hated being at the vets. She hated being caged and hated being away from home. I only let the vet keep her for four days, as having dealt with one paralysed dax we knew we could give her the same treatment as the nurses. Something happened at the vets between the Saturday when I saw her and when I insisted in bringing her home on the Monday. The vet was a little odd and said he was concerned she had taken a step backwards. What I saw on Saturday which was Jaz in her full fighting spirit and very vocal about being left in the vets, and what I was greeted with on Monday were two totally different animals. Jaz was withdrawn and not at all well. I took her straight to see my own vet on the Tuesday. He was so upset when he saw Jaz and advised that his pronosis was not good, but as we had come this far to see how she went, but he wanted to see her again in a week. Jaz continued to deteriate, and it become obvious to me that all her nerves were dying leaving her more and more paralysed. She could not even move herself forward or lie down. I took her in Wednesday morning and had her put down. 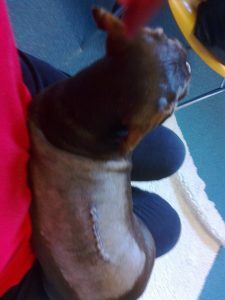 My advice to any one whose dog becomes paralysed is to consider firstly the dog and its attitude. 1. Would it cope with being caged for many hours and restricted exercise. 2. 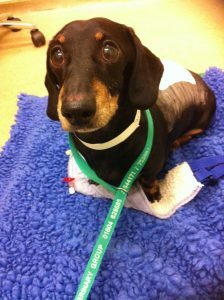 Have you got the time to spend carrying out daily physio and dealing with the periods of pain (normally 24 – 36 hours) when the little dog will run round the house yelping trying to out run the pain, or sit, totally tensed waiting for the next spasm. 3. if incontenent, can you express its bladder and clean up after the dog when perpetual motion means it will poo without knowing about it. Is it fair to the dog’s mental state, if it is normally a clean little dog, to realise it is peeing and pooing where it should not. Jaz peed down me three times in two days because she could not empty her bladder herself and managed to do the same to a nurse and a vet. 4. Your dog may never walk again. Will he/she be happy in a cart. Do you have the right enviroment for a dog who will drag their back legs across surfaces. 5. They do require a lot of time, and different requirements, and as a consequence of their disability, are more expensive to keep. Nearly all the equipment is manufactured and available from the USA. 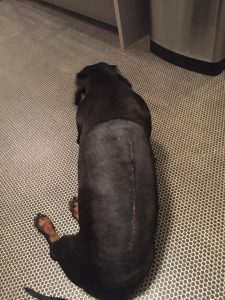 Jaz was a bad experience I will never repeat because it has left me feeling so bad for putting her through such mental trama when I should have been brave enough to stand up to the vet who did not know me from Adam and say no to the referal and put her down. It is so difficult, and such an emotional time, when your little healthy looking dog cannot feel anything from the shoulders down and only 3-4 years old. But please take a big breath and think about the above questions and especially how your dog will cope if still paralysed should you choose an op. 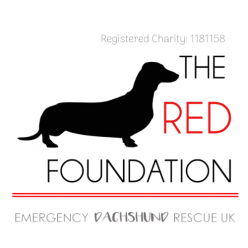 Previous Previous post: Emergency Dachshund Rescue UK?